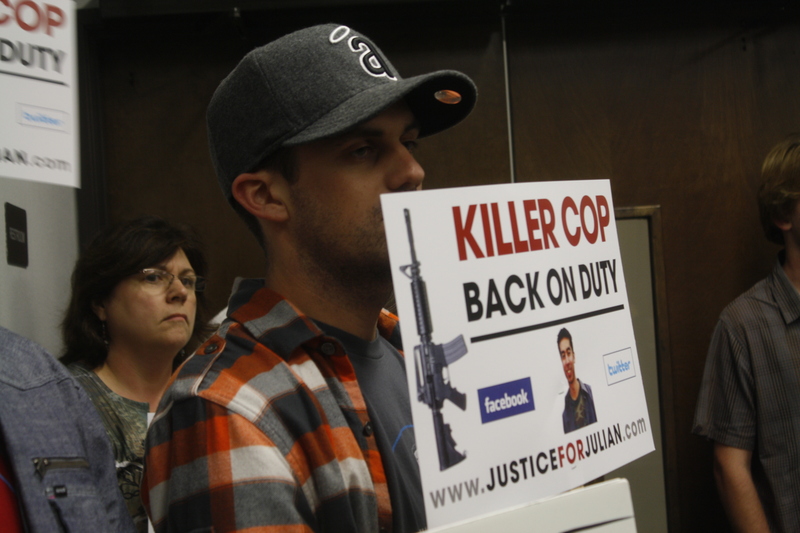 Protesters in the officer-involved shooting death of Julian Collender by the Brea Police Department packed a Yorba Linda City Council meeting tonight with signs and their strong opinions about why the investigation has not produced answers. 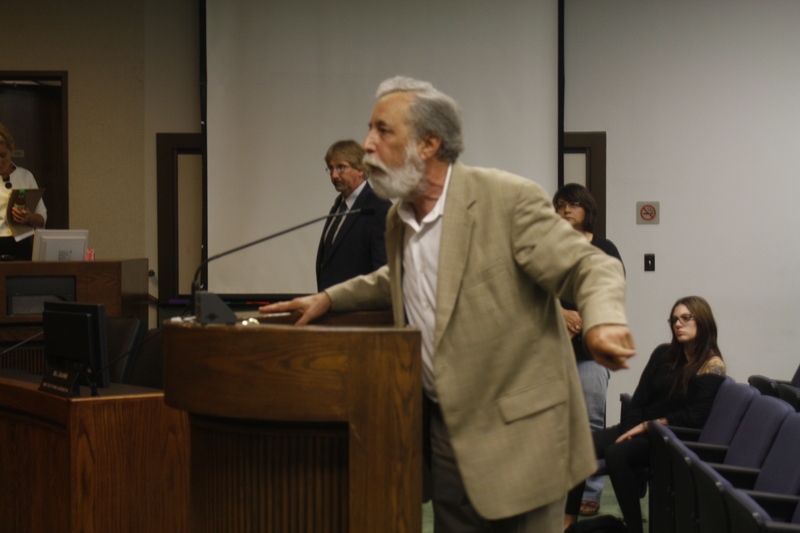 Dozens of people attended the highly-contentious meeting, which lasted more than three hours because of a stream of people wanting to make public comment and a closed-session meeting of the City Council. She called for transparency in the police department and demanded that those responsible for her brother’s death be held accountable for their actions. Julian Collender, 25, was shot to death in front of his home by Brea police officers in June after a call of an armed robbery in which he was considered a suspect. Family and friends allege that the police shot Collender to death with a high-powered rifle. The Orange County District Attorney and the Brea Police Department are still investigating the matter and the unnamed police officers involved in the shooting only got off with a suspension. His death had prompted strong anger against the police department, whom they accuse of withholding information under the guise of an investigation. It also left very important questions unanswered: Who were the police officers involved in the shooting and why has it taken nearly three months since the authorities updated the family and the public about the shooting death? The protesters, led by members of the Collender family, wanted the City Council to press the Brea Police Department, which Yorba Linda contracts its police services, to answer questions as to why the police officers involved have not been named and why these shootings had to happen in the community. While Michele lashed out at the City Council and the Brea Police Department for their inaction in her brother’s death, some of the other speakers wept on the podium asking how the police would allow this incident to happen in a safe, affluent community. The loudest anger came from other speakers that followed Michele. Ron Short, a supporter of the Collender family, accused the city council of tolerating the Brea Police Department’s pace of the investigation and condemned their leadership. The audience gave him a standing ovation after he made that comment. The loudest condemnation of the City Council and the Brea Police Department came from Julian’s father, Richard, who spoke for several minutes, but his comments were not recorded by the city clerk because Mayor Pro Tem Nancy Rikel adjourned the meeting for a break. Richard Collender urged the City Council to place the agenda on the item for the next meeting. “If you don’t agendaize this item, I have to believe that you don’t give a damn,” he said. After the adjournment and meeting with the Collender, Mayor Pro Tem Rikel and other council members gave their condolences and asked for patience while the investigation continues. It wasn’t enough for the family, who said that an apology wasn’t enough. 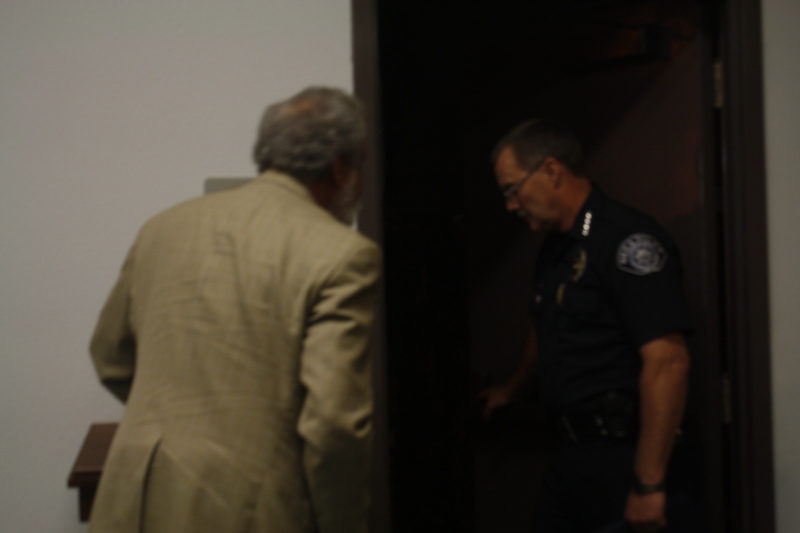 As the City Council meeting adjourned for the night, James Collender, Julian’s brother, lashed out at Brea Police Chief Billy Hutchinson for nodding his head in disapproval of the public comments. His father, Richard, joined him in berating the police chief, repeatedly calling him a “coward” for refusing to confront him and accused a police officer of touching him as he lashed out at the police. The police chief left the City Council chambers without answering the family’s questions and the city council members followed suit afterward. Richard Collender, father of police-shooting victim Julian Collender, confronts Brea police chief Billy Hutchinson at the close of the Yorba Linda City Council meeting Tuesday. Richard Collender condemns the Yorba Linda City Council for its inaction in his son's death. In the end, nothing new came out of the City Council meeting, except that city council member Jan Horton asked her colleagues to draft a letter to the District Attorney to speed up the investigation. The police officers who shot Julian are yet to be named and any information from the investigation has yet to be released. The anger that started with the meeting still resonated amongst the protesters. It is unclear when the District Attorney and the Brea Police will conclude its investigations, but friends and family of Julian Collender want answers now. …and yet, despite the OC Weekly’s extensive coverage, Matt Coker wasn’t there to follow up on his article on the Justice for Julian’s efforts to confront the Brea Police Department, including Chief Hutchinson. More about Julian Collender to follow in an upcoming blog post.